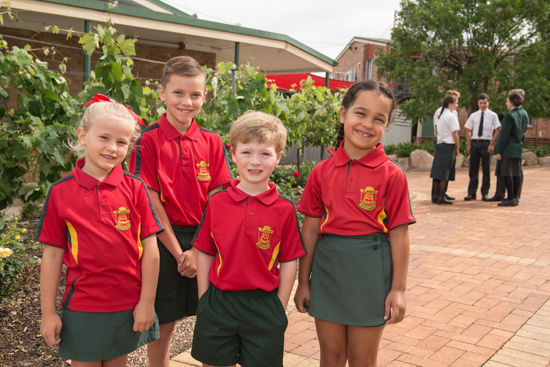 Uniforms can be purchased at Gleesons Mercery situated at 4 Maryland Street, Stanthorpe. They carry uniforms for students across all of the age levels of the school. Prep students also have a yellow hat to wear during play times. This is presented by the school to students on their first day. Blazer (Year 11 & 12). Students wear the formal uniform on Monday, Wednesday and Friday. The sports uniform is worn on Tuesday and Thursday. The uniform should be neat, tidy and clean at all times. The wearing of hats is compulsory at all times when outdoors. Students are required to wear wide-brimmed hats for maximum sun protection and these may be the navy or grey formal school hat, Primary wide brimmed hat, prep cap or the sports hat in Secondary. No other hats/caps are to be worn with the school uniform. Students who wear other hats/caps will have them confiscated. Hair must be neat and tidy and should clear the collar if worn long. Styling should be such that it is acceptable to the general community. We will NOT accept any unusual hairstyles at the school. As general guidelines the following will need to be understood. Students should be clean shaven at all times. Makeup and nail polish are not acceptable for students in uniform. Students may wear one pair of studs or sleepers in the lower lobe of their ears. Earrings must be removed when playing sport. Students may wear one ring. A watch may also be worn. Students are able to wear a religious medal or crucifix on a chain around their neck. Any other jewellery will be confiscated and held until the end of the day or parents make arrangements to collect items.